Lovely Alba is one of the last perfume of the Mizensir brand. Above all,it is a charming,loving and caring story from father and grandfather. In fact, Alberto Morillas imagined Lovely Alba for Veronique, his daughter and Bianca, his granddaughter. Therefore, he expresses in a perfume all the empathy and love of a father. While in 2016, The Artisan Parfumeur introduced us with Natura Fabularis, the brand, today opens a new chapter with the olfactive impressionism. 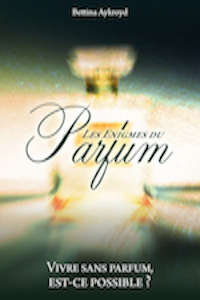 For the occasion, Fabrice Pellegrin, the perfumer has worked up two fragrances, Sur l’Herbe and Au bord de l’eau. Two names after the famous impressionists, such as Manet and Monet. I love Sur l’Herbe at first sight… Sur l’Herbe from the Artisan Parfumeur, of course ! 1978-2007 ! 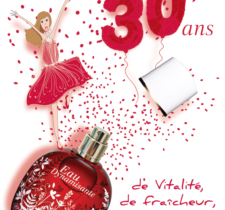 It’s already thirty years ago, that Jacques Courtin-Clarins, launched Eau Dynamisante. This beautiful red flacon, in a round shape has still not taken a ride : nor it’s fragrance which is timeless and joyful. In order to celebrate it’s 30 summers, Eau Dynamisante comes out in an limited edition flacon. Let’s look back onto this lovely story and from now on, a Clarins cult fragrance. The Oud has become almost a major ingredient… into the creation of perfumes. Today, nearly all the brands have their Oud fragrance. However, the are various qualities of oud. Finally, the look of the creator, his perception of the ingredient and it’s interpretation may find it captivating but different. Here, Alberto Morillas, perfumer from Firmenich and founder of the Mizensir brand gives us his different meanings of the Oud, with a collection of three fragrances. Penhaligon’s portraits, the olfactive fiction, started last year, continues with a second chapter. 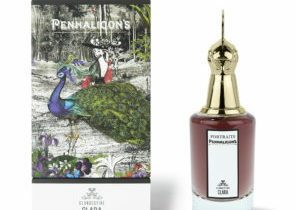 Penhaligon’s introduces us to Clandestine Clara, Lord George’s official mistress, and it’s Roaoring Radcliff, his hidden son, who appears on the scene. The plot gets tougher and no doubt, it will not be boring ! The perfume brand is having fun, and pays a tribute to the British spirit between humor and provocation.